Carmichael coal mine means more jobs, less water for Queensland. The $16.5 billion Carmichael Coal and Rail Project was given federal approval last week, a greenlight for Indian company Adani to proceed with development plans for what will be Australia’s biggest coal mine. The Queensland state government has said the new project has the potential to create 6400 new jobs, estimated at 2500 construction jobs and 3900 operational jobs. Federal environment minister Greg Hunt signed off on the project on Thursday, subject to 36 strict conditions. These conditions relate largely to planning for conservation of groundwater, an issue of extreme concern to environmentalists. The conditions include provision for a Great Artesian Basin Springs research plan, which must be submitted to the environment minister three months prior to the excavation of the first box cut. The research plan must “investigate, identify and evaluate methods to prevent, mitigate and remediate ecological impacts on… native species dependant on natural discharge of groundwater from the Great Artesian Basin,” including impacts on the Doongmabulla Springs Complex in the Galilee Basin, and the Surat Basin, and the plan will be subject to peer review. Adani must also contribute $100,000 per year for 10 years for a biodiversity fund aimed at the better protection and long term conservation of EPBC Act listed species and communities. The environmental approval has been listed as effective until 2090. Minister Hunt said the project, at full export capacity, will contribute $930 million to the Mackay region’s GDP, and $2.97 billion to the Queensland economy each year for the next 60 years. The lifetime resource value of the project is estimated at $300 billion, from a measured coal resource of approximately 4 billion tonnes. Coal from the Carmichael mine will be exported to India through Abbott Point Terminal, which will require expansion in order to cope with the export of an estimated 60 million tonnes of thermal coal each year. 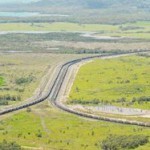 The Queensland Resource Council’s chief executive Michael Roche has passed congratulations to Adani on attaining federal environmental approval for the Carmichael mine, stating that the mine and its rail and port infrastructure will “drive thousands of new jobs and opportunities for Queenslanders in construction and permanent operational jobs for decades to come”. 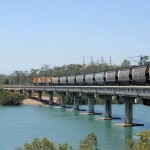 “Regional communities including Alpha, Clermont, Emerald, Bowen, Moranbah, Mackay, Rockhampton and Townsville are all expected to benefit from the development of the so-far untapped resources in the Galilee Basin,” Roche said. Queensland deputy premier Jeff Seeney also welcomed the approval, touting the high number of jobs to be created and economic benefits to the state. “The project proposes a combination of open-cut and underground coal mining and is forecast to produce 60 million tonnes of thermal coal a year for export,” he said. Not everyone is optimistic about the benefits Carmichael will bring to the Central Queensland region, with some indicating that a workforce made up of FIFO and 457 migrant visa workers will greatly reduce employment benefits in the region. Regional development expert Professor John Rolfe of Central Queensland University said the mine could offer “very large” economic benefits thanks to its scale and lifetime, but that it would depend on where the workforce was sourced. “If the workforce flew in-flew out from Brisbane or Sydney… then regional Queensland would receive much smaller economic benefits,” he said. The mine will use approximately 12 billion litres of water each year, as estimated in a report by the Independent Expert Scientific Committee on Coal Seam gas and Large Mining Developments, a report which was ignored by both Adani and the Queensland state government. Minister Hunt has said the mine must return 730 megalitres of water to the Great Artesian Basin each year for five years, an amount that is equivalent to only 6 per cent of the independently estimated usage. Environmental groups, independent researchers and agricultural groups are concerned the mine will dry up aquifers necessary to the continuance of agricultural industry in the Great Artesian Basin. Concerns have also been raised about further dredging of the Great Barrier Reef at Abbott Point in order to make way for the port expansion. International banks Deutsche Bank and HSBC have refused to fund the Abbott Point port expansion, having pledged to distance themselves from the environmentally controversial project in order to protect their reputations.